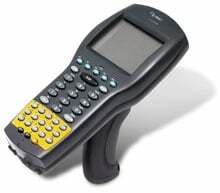 Datalogic Falcon 340 - Batch Portable Data Terminal, 48 key Keypad and Linear Imager. Fast, accurate, customizable, real-time automatic data collection. The Falcon 340 with the 486 processor and 8MB of RAM is one of the most powerful batch terminals on the market today. Fast lookup and validation of your data is critical to productivity. These sleek new portable terminals were ergonomically designed with the end-user in mind. They are the lightest weight unit in their class, only 16.3 oz./465 g. Engineered to reduce fatigue, this weight is ideally balanced over the hand using a form-fit rubber-grip handle. Combine this with an integrated scan trigger, a large 16-line back-lit display and a complete 38 key alphanumeric keypad and the user enjoys hours of high performance data collection. Falcon 330/340 Series Serial Starter Kit. Includes everything you need to run your Falcon 330/340: charging/communications cradle, serial cable, US power supply and battery. The Datalogic 340-0000-029 is also known as Data Logic	PSC-3400000029	or 3400000029	.